Share the post "Watch COREY TAYLOR Perform VAN HALEN, GUNS N’ ROSES Classics In Green Bay"
SLIPKNOT and STONE SOUR frontman Corey Taylor played a solo concert April 14 at Green Bay Distillery in Green Bay, Wisconsin. 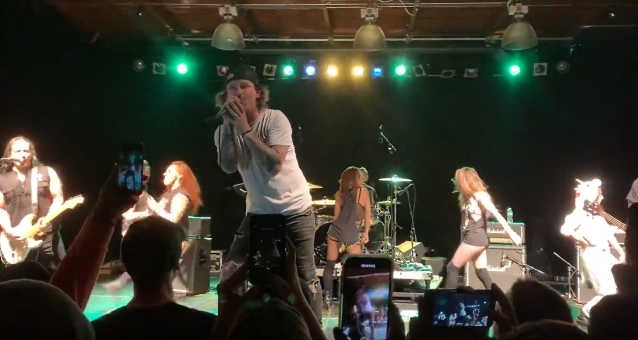 Billed as COREY TAYLOR & FRIENDS, the night also included an opening set by CHERRY BOMBS, the all-girl dance group led by his fiancée Alicia Dove. Fan-filmed video footage of Corey‘s performance — including renditions of classic songs by VAN HALEN, GUNS N’ ROSES and DEAD BOYS — can be seen below.